2. S.A. Mackey's "three virgins"
"He was one of the first writers to publicly challenge the biblical dogma that the earth was no more than about 6000 years old, and argued instead that the earth, and humanity too, was millions of years old. He was invited to join the Freemasons, but refused to do so as he wanted to preserve his independence. He died in an almshouse. " In this article, we are going to review some of the assertions and related interpretations of S.A. Mackey regarding the Dendera zodiacs, as his material on this subject is quoted several times in H.P. Blavatsky's The Secret Doctrine and elsewhere. "We are told by Herodotus, that the […] men of learning in this country [Egypt], informed him, that, the Pole of the Earth and the Pole of the Ecliptic had formerly coincided. I have seen, in Denon's second volume of Travels in Egypt, two ancient Zodiacs, from a temple in Tentyra or Dendera, where the Poles have been represented in both situations: and in that which shews the Poles at right angles, there are marks which shew, that it was not the last time they were in that position: but the first. […] [T]he chief characteristics of its being a monument commemorating the first time that the Pole had been in that position, are, the Lion & the Virgin. […]"
Fig. 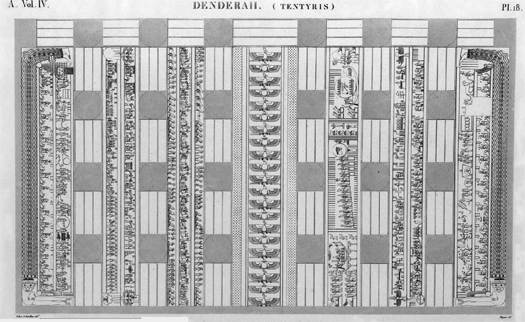 1 Part of S.A. Mackey's drawing of the rectangular zodiac of Dendera. It depicts the "three virgins" between Leo and Libra. Thus, Mackey interpreted this group of three figures between Leo (the Lion) and Libra (the Scales) as a triple representation of the Virgo constellation, thus showing that the poles had been three times “within the plane of the Ecliptic”. Fig. 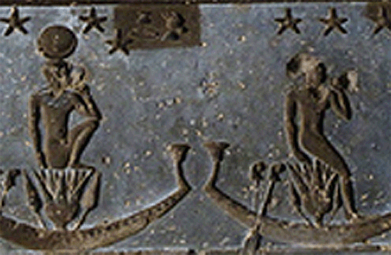 2 An image of a portion of the actual rectangular zodiac of Dendera, as found at the temple of Hathor, Dendera. In this image, the female figures in question have been marked by a dot-sign placed above them to make them more distinguishable. Fig. 3 Overview of the rectangular zodiac, with the female figures in question highlighted in red. The matter of these female figures is treated somewhat further in the relevant section of the notes . For the purposes of this section, the above observations make it clear that a connection between the wheat-bearing Virgo and the female figures in the rectangular zodiac is rather doubtful. Fig. 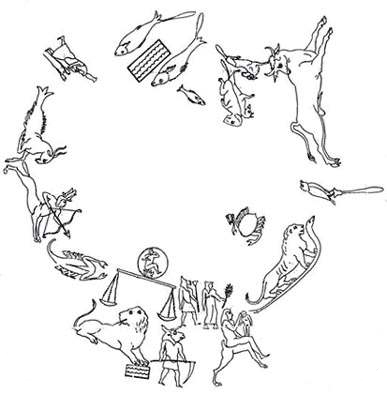 4 S.A. Mackey’s drawing of the circular zodiac. The “upper” or “higher” part of the zodiac corresponds to the summer solstice (Midsummer), where the sun rises at it’s highest point in the sky. The “lower” part of the zodiac corresponds to the winter solstice (Midwinter), where the sun rises at it’s lowest point in the sky. The “pole with a knob” in the zodiac is indicative of the top, but to prevent doubt, the knob is placed touching the mouth of the female figure, and it is unthinkable to suppose that the mouth in the head, was intended to represent the bottom of the zodiac. Thus, the above suppositions are thought to fully demonstrate that Cancer (placed at the feet of the figures) was a winter constellation, and Capricorn (placed at the head of the figures) a summer constellation. However, it is obvious from Mackey’s comments that he is interpreting the zodiac without at all taking into account the respective context in which it is found – in fact, apparently being ignorant of it. All religio-philosophical systems, and even simple schools of artistic depiction, have some characteristic symbols and “motifs” which need to be interpreted in a proper context, to avoid gross misrepresentations and misunderstandings from taking place. Even things that can seem “evident” to oneself, may carry different meanings and connotations in a different cultural setting, characterized by it’s own mythological background and social standards. For instance, we may ask at this point: By showing a painting of a Tibetan Buddhist “wrathful deity” to an observer thoroughly unacquainted with the subject and with Tibetan iconography, would the observer in question without a doubt consider it “evident” that this is a depiction of an enlightened being, exerting itself for the benefit of the world? Or would the simple depiction of the hairy primordial man “Pangu” -- ascribed by Chinese mythology to being the divider of the primordial world egg into Heaven and Earth – instantly and unanimously convey the idea of a universal “builder”? Obviously, these crude examples, and other similar and potentially more subtle ones which could be cited, evidently show that to properly appreciate a “mythological” depiction, and even any depiction related to a specific cultural setting, it is important to sufficiently acquaint oneself with the basic symbols and concepts characterizing that setting. Consequently, we can proceed to see how S.A. Mackey’s assumptions relate with basic Egyptian symbolical concepts. Mackey assumed that it is evident that the female figures encompassing the rectangular zodiac can be used for deriving the zodiac’s “top” from it’s “bottom” portion. However, the figures in question, are depictions of the Egyptian female deity Nut, which translates as “night”, and was mythologically / astronomically ascribed to arching over the earth, and spreading over it as the vault of the sky. Nut was traditionally and consistently considered as arching over the earth in an East-to-West direction, giving birth to the astronomical bodies (such as the Sun, Moon, stars and planets) in the eastern horizon, and “eating” them as they reached the western horizon. The astronomical bodies were said to be sailing over her body in “boats”. The Sun would be daily given birth to by Nut in the east, traverse the expanse of the sky, and eventually become “eaten” by her in the west, where the Sun’s nightly journey in the Duat (the so-called “underworld”) would begin, this time in a West-to-East direction – which would eventually lead the Sun to be reborn in the eastern horizon the next day. Fig. 5 The “Book of Nut”, as found on the ceiling of the cenotaph of Seti the First, at Abydos. It thus becomes quite clear that the head, mouth and feet of the figure of Nut carry quite different connotations from those that Mackey readily ascribed to them. This presents problems for Mackey’s subsequent conclusions, as can be readily perceived. Fig. 6 The goddess Nut, as found on the ceiling of another part of the temple of Hathor, Dendera. It is by her mouth in the hour of s.htp.n.s in the evening that this god enters [the Duat]. [...] That is to say, it is by her mouth in the third hour of [the] evening that he enters [the Duat]. They -- that is to say, the stars -- are in the place at her [Nut's] hind part in the east every day, as she gives birth to Ra daily." The above-cited exemplary extracts make a fitting overview of the cosmology, astronomy and mythology pertaining to the figure of Nut. They also make clear a number of difficulties with Mackey's initial assumptions, as his approach to several crucial elements of the iconography in question is evidently quite foreign to the meaning understood by the ancient Egyptians themselves, when portraying those cosmological iconographical elements. On account of the fact that Nut is said to "give birth to" and "eat" the celestial bodies daily, and also due to the fact that Nut's body is described in certain places as the ‘celestial river’ on which the celestial bodies “travel” both by night and by day, it is occasionally stated that the celestial bodies, after being "eaten" and while remaining unseen, actually travel within the body of Nut in a West-East direction, approaching the point of their eventual re-appearance by means of becoming "reborn" by Nut in the east. This same interval between setting and rising is described as the passage of the Sun-god Ra through the Duat. Furthermore, the stars are also described as going through the Duat in the interval between their setting and rising. Due to the above partially interlaced descriptions of the cyclic path of the Sun and the stars, and due to their travelling "inside Nut" when they are not seen, there are occasions where this cycle is depicted by means of employing two Nut figures rather than one, where one Nut figure corresponds to the East-West direction pertaining to the daily path of the Sun, and the second Nut figure corresponds to the West-East direction pertaining to the nightly path of the Sun through the Duat, on his way to being reborn on the eastern horizon. 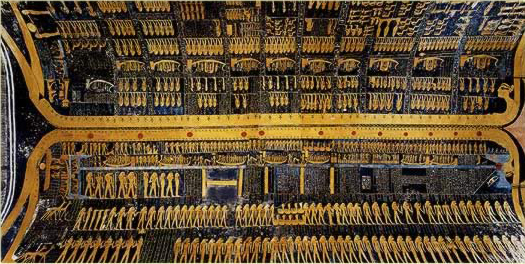 as found on the ceiling of the tomb of Ramses VI, Valley of the Kings. In the “Book of Day” shown above, Nut is strung with Sun disks, tracing the day course of the “celestial river”, while in the “Book of Night”, Nut is strung with stars, tracing the night course of the same “river”. Observe that the course of the “river” changes for each Book, the “Book of Day” being read East to West (left to right, as appearing in the image above) while the “Book of Night” being read West to East (right to left). Each 'book' is divided into 12 "chapters" or sections, each one of these "chapters" describing the events taking place in each hour of the Sun's cyclic journey. As the ancient Egyptians divided a day (and night) into a 24-hour period like we do today, the day was allotted 12 hours, and the night was allotted the remaining 12. It is worthwhile to note here that in the "Book of Day" portion of Fig. 7, the body of Nut has a total of 12 Sun-disks strung upon her body, corresponding to the 12 hours of the day, each of the Sun-disks roughly positioned in accordance with their related "chapter" as found along Nut's figure. In Nut's mouth and hind portion there are two more Sun-disks, thus punctuating the "birth" and the "devouring" of the Sun at the day's start and end, and also punctuating the beginning and end of the "Book of Day" as a whole. It is known that, in the Egyptian depictions of the 12 zodiacal signs that are available to us, the sign of Cancer/Crab has often been intermixed with the Egyptian scarab, or dung beetle. 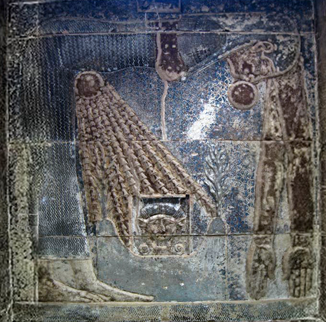 Furthermore, by looking at the rectangular zodiac of Dendera, it is evident that the part of the zodiac where the sign of Cancer is to be found, is at the feet of the Nut figures. There, we find two depictions of a scarab, one at the feet of each figure. Fig. 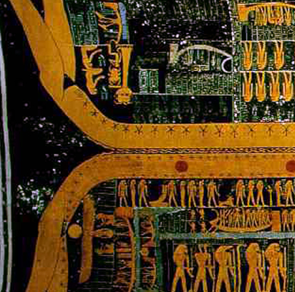 8 Portion of the rectangular zodiac, showing the scarab figures found at the feet of Nut. 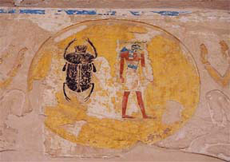 Thus, Mackey assumes that the two scarab/beetle figures are solely related to the depiction of the sign of Cancer. In continuation of his assumption that the feet of the figure must correspond to the winter solstice, he considers the “crab” to be depicted as a winter constellation. Furthermore, he interprets the appearance of two scarabs/crabs as an indication that the crab is “divided near it’s middle”, i.e. that the winter solstice occurs in the midst of Cancer. However, by acquainting ourselves with the context of the Egyptian symbols that Mackey readily attempts to interpret in the above manner, it soon becomes apparent that the subject involves quite different dynamics. Fig. 9 Depictions of Khepri. Fig. 10 The three aspects of the Sun, wall painting in Luxor. Khepri in the morning, Ra at mid-day, and Atum in the evening. [Name] shall embark into it, like Ra. for you are indeed Ra, who comes forth from Nut, who gives birth to Ra every day. “Homage to you, O you who has come as Khepera, Khepera, the creator of the gods. You rise, you shine, making bright your mother [Nut], crowned king of the gods. He [the Sun] enters as this scarabaeus. He comes into existence as he came into existence the first time on earth, in primeval time. From the indicative quotations cited above, the context of the Egyptian deity Khepri may be better understood. 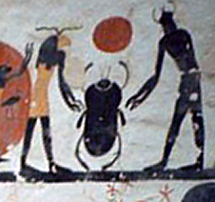 The consistent semi-astronomical attribution of Khepri as the rising Sun in the eastern horizon is also appreciable from them. In consequence of the above, the scarab at the feet of Nut as seen in the rectangular Dendera zodiac (Fig. 8, right portion) , along with the effulgent orb (which Mackey interpreted as a “knob”) emerging from Nut’s body, are quite understandable in their respective context. As for the face among the rays of the Sun (Fig. 8), it is the face of Hathor, the goddess of the temple in question, whose face is seen on the pillars throughout the temple  . Fig. 11 Temple of Hathor, Dendera. Left: Main entrance of temple. Right: Relief found on the underside of the top portion of the temple's outer gate. From the above, it should be quite demonstrable by now that the rectangular zodiac's portrayal of the scarab and the effulgent solar orb emerging from Nut's lower body is an Egyptian iconographical element that has a most well-defined intended meaning, and also is of cardinal cosmological significance in Egyptian mythology, thus making it quite unfit for inventive interpretative approaches -- especially as uninformed ones as Mackey's. Of course, needless to say, the scarab would not be liable to appear in any other part of Nut's body than in Nut's feet, and this is perfectly explainable by the very definition of the scarab in Egyptian symbolism (as has been given in summary above). Thus, as it would be expected, it is worthwhile to point out that in all depictions of the scarab in association with Nut, the scarab is consistently portrayed in that position of Nut's body in virtually all extant representations of it that have been preserved in Egypt to this day. But let us focus on a particular attribute of the scarab Khepri, which can help us account for the duplicate scarabs seen in certain representations of Nut and Khepri. As was pointed out earlier, the ancient Egyptians divided the time between two successive risings of the Sun into 24 hours, like we do today. In certain representations and texts, like the "Books of Day and Night" (Fig. 7), where the journey of the solar deity is divided in two portions of "Day" and "Night", the figure of Nut is also duplicated in order to accomodate the portrayal of the Solar deity's cyclic path in it's entirety (both in the East-West and the West-East directions). In these cases, each Nut figure is allotted 12 hours. Furthermore, the part of the picture where the two Nut figures' heads converge is the "turning point" from Day into Night (see Fig. 12), and the part of the picture where the Nut figures' feet converge is the "turning point" from Night into Day. Fig. 12 The end of the "Book of Day". Detail from right portion of Fig. 7, found above. Once past the "turning point" shown in Fig. 12, the “Book of Night” begins, detailing the course of the solar deitiy's "barque" through the 12 consecutive hours of the Night. "To come out of the Duat, to rest in the Morning Barge, to navigate the Abyss until the hour of Ra, She who sees the beauty of her Lord, to make transformations in Khepri, to rise to the horizon, to enter the mouth, to come out of the womb, to burst forth out of the Gate of the Horizon of the Hour, She who lifts up the beauty of Ra in order to make live men, all cattle, all worms he has created. " Fig. 13 "Books of Day and Night", eastern portion, denoting the end of the "Book of Night" and the beginning of the "Book of Day". 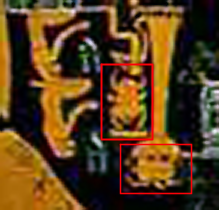 Two scarabs occupy the concluding portion of the “Book of Night” (magnified in the image on the right). A winged scarab pushing the solar disk is placed in the beginning of the “Book of Day” (seen in the lower left portion of the image on the left). Thus, this version of the "Book of Day and Night" happens to display a total of three scarabs in the region of Nut's lower body. Comparing the above with the layout we find in the rectangular Dendera zodiac (Fig. 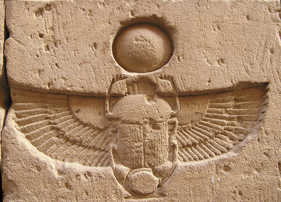 8), with it’s multiple scarabs / beetles, one winged and depicted at the lower part of one Nut figure, the other non-winged but directly adjacent to the effulgent solar orb emerging from Nut’s womb, it is quite appreciable that the depiction of multiple scarabs has very specific connotations in Egyptian iconography, commonly employed for denoting different “moments” in the Sun’s journey. They are similar to the depiction of multiple solar orbs in a single picture . So, at this point, it may be justifiably asked: What is the connection of the scarab with the zodiacal sign of Cancer, or crab, in the overall depiction of the rectangular Dendera zodiac? As we see, in compositions such as the “Book of Nut”, and "Books of Day and Night", although multiple scarabs make their appearance in the lower body of the goddess Nut, there is no trace or mention of any other of the 12 signs of the zodiac, as commonly understood today. The ecliptic is divided into 36 decans instead. Ancient Egyptian astronomical texts, drawings, and inscriptions are available to us in large number, and from various times of ancient Egypt’s known history. Examples of these are the "Book of Day and Night", and the “Book of Nut”, mentioned previously. There are plenty of other stellar depictions however, which collectively form a large corpus of material for study. Despite the fact that plenty of astronomical material is available to us from ancient Egypt, very much of this material remains quite doubtful as to its precise identification with our currently defined constellations and divisions of the sky. The reason for this is that, as far as available inscriptions and texts show, the ancient Egyptians used a system of constellations which was quite distinct, and – at least for long periods of time – did not involve any of our familiar depictions for representing constellations (such as the currently used system of the 12 zodiacal signs). Instead, much like other ancient astronomical traditions (for example: the ancient Chinese astronomical tradition), ancient Egyptians had quite distinct ways of mapping the celestial sphere into divisions, groups and distinct constellations, thus providing us with a star map which is difficult for current astronomy to decode in terms of which precise star groups their maps were referring to. Fig. 14 Some northern circumpolar constellations, as shown in three different astronomical paintings. (these being extracts from the complete paintings). Circumpolar constellations are constellations which are found in the vicinity of a celestial pole (the north one, in this case). Although the greater portion of these ancient Egyptian star maps remains uncorrelated with modern star maps in strict exactness, or are mostly disputedly correlated, they maintain a significant internal cohesion of expression among themselves, communicating a distinct system of mythological and astronomical description. This can be partly appreciated in the exemplary extracts from star maps that have been put side by side for comparison in Fig. 14. Although in cases it may be that several centuries may divide each of these maps from the others in terms of historical chronology, their content is in the greater part consistent with all earlier or later equivalents, and evidently portrays the same system of charting the sky, both in the constellations' conceived appearance and also in the constellations' names. Thus, throughout the vast corpus of extant astronomical material that can be consulted, there is a distinct consistency in using the constellations of a purely Egyptian origin, without any reference to what is understood today as the 12 zodiacal signs (Pisces, Aries, etc.). We do find this system of 12 zodiacal signs utilized in a very characteristically small number of Egyptian astronomical texts and inscriptions, however. It is significant to note that these cases of appearance of the 12-sign system seem to conform very closely with one another in terms of a very specific and short historical timeframe. This has to an extent to do with what appears to be a chronologically synchronous construction of temples in various parts of Egypt, which all bear similar internal decoration and imagery, as well as cartouche "signatures" by the rulers of that time period. The subject involves other kinds of apparent historical "synchronisms" which are worth pointing out, so it will be discussed below. As it was briefly mentioned previously, all the 12-sign depictions available to us from ancient Egypt, appear to uniformly be part of a specific time period. This time period corresponds to a quite late part of ancient Egyptian history, at least as far as the monuments in question are concerned (which happen to contain these depictions). This means that the older depictions of astronomical subject matter systematically include only the constellations which are distinctly local in origin (such as the ones shown in Fig. 14), and do not show any similarities with the modern 12 zodiacal signs in their arrangements. Instead, the ecliptic is divided solely into 36 segments represented by the 36 decans. There are occasional variances among lists of decans in terms of their specific names, but the decans systematically number 36 in number, and are the sole dividers of the ecliptic. On the other hand, the few astronomical drawings depicting the 12 zodiacal signs appear in temples and settings which are known to have been built (or rather rebuilt) during the Ptolemaic period (starting in the 4th century BCE), and also the Roman Period. The temple of Hathor at Dendera in the form that is known to us today, although indisputably being the last “embodiment” of an immensely older and very influential temple, is a monument whose date of construction is assigned by archaeology to the Ptolemaic period (332-30 BCE). This is appreciable from a number of clear indications, such as the very specific mention of the endeavor of various historical rulers in building the temple, as also their “signatures” in the parts of the temple that they themselves completed, or added. As a consequence, the current structure of the Dendera temple is said to be the result of an endeavor which took place in the first century BCE. Furthermore, and as a result, there are numerous Egyptian rulers and Roman emperors from that period depicted on it’s walls. Other characteristic features of it are the empty cartouches  which are found throughout the temple, including the immediate vicinity of the zodiacs. These are understood to be the result of the very uncertain political climate of the Ptolemaic times, which led to reluctance to fill royal names in, as the succession of rulers was quick and their rule short. It is a feature shared with other temples from that period . Fig. 15 Empty cartouches at the temple of Hathor, Dendera. Obviously, the apparent fact that the temple as it stands at the moment is a quite late construction does not at all detract from the fact that the temple’s site has housed a long succession of previous temple “embodiments”. This is appreciable to us from the writings in the temple itself, but also from other comparative sources, which make it clear that the Dendera temple is a site with long history. First, we could refer to a drawing found on the coffin lid of Heter, a ruler from the early Roman period (about the first century CE). This drawing involves a depiction of Nut, along whose sides we see constellations, and representations of the 24 hours of the day and night  . The zodiac of 12 signs is prominent, and has been somewhat differentiated from the other purely Egyptian constellations, the 12 signs being placed in the direct vicinity of Nut’s body. It can be seen that the Egyptian imagery is rather haphazardly put together. The scarab at Nut’s feet has been placed in an adjacent enclosure in a corner (top right of the left portion of Fig. 16). Noteworthy is that the scarab and crab are here depicted as distinct ideas, as the crab can be seen among the 12 zodiacal signs depicted. Furthermore, the symbols used for the zodiacal signs are in agreement with the Dendera zodiac ones (Leo is drawn over a snake, Virgo holds an ear of wheat etc). Fig. 16 Astronomical representation, found on coffin of Heter. The portion showing the zodiac of 12 signs is magnified in the image on the right. Another good example would be the astronomical representation on the coffin lid of Soter, a Roman Period ruler of the area of Thebes, who lived in the second century CE. The astronomical representation in question (seen in Fig. 17), drawn about a century after Fig. 16, is evidently involving much less strictly Egyptian elements – perhaps on account of Greco-Roman iconography gradually becoming more prominent. The drawing’s inscriptions are in Egyptian hieroglyphic and Greek. The 24 hours of the day and night are represented along the sides as female figures with stars overhead (see bottom border of Fig. 17). Egyptian constellations (such as those in Fig. 14) do not appear at all in this drawing. The figure of Nut is seen stretched in the middle portion, with the zodiac arranged around her. Decans, and Egyptian barques of constellations do not appear, apart from two representations of the Sun’s barque on each side of Nut’s head. Furthermore, we can see the scarab specifically placed at Nut’s feet, although here too it is drawn as a notion distinct from the sign of Cancer, which can be seen as a crab on the bottom right portion of Fig. 17, under Nut’s armpit. Fig. 17 The coffin lid of Soter, from the second century CE. Here too we see Leo drawn as a lion over a snake, and Virgo as a female figure holding an ear of wheat, or another type of grain. Other examples which could be cited are the Petamenophis coffin lid (2nd century CE), the Anthribis zodiacs (2nd century CE), etc. . 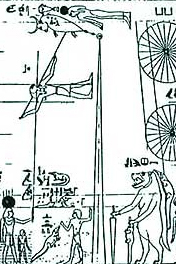 This manner of astronomical depiction, although not present in any inscriptions and drawings prior to the Ptolemaic period, becomes the norm from the Ptolemaic period onward. From the above indicative examples, it can be seen that Egyptian iconography was utilized in peculiar ways during the Greco-Roman period, often infused with non-Egyptian iconographical elements. There also seems to be less prevalence of ancient Egyptian iconography, which is a ramification of the extensive Greek and Roman presence in Egypt at the time. At this point, it should be clear that the above examples of Fig. 16 and Fig. 17 show a ready relation with depictions such as the Dendera (and also Esna) zodiacs – which form parts of temples which underwent extensive renovations in the Greco-Roman period. Equally evident, is the strict absence of this type of iconography of the 12 signs from drawings found in monuments and inscriptions of much earlier periods (such as the examples shown in Fig. 14). In consequence, even though it is definite that the Dendera temple was built in accordance with the plan of an earlier structure, it is clear that the Dendera zodiacs as known to us today involve an iconography cognate to the Ptolemaic period, and when taking into account the other architectural elements of the temple they are found in (the empty cartouches, the Ptolemaic and Roman emperor “signatures”, the renovations etc) they cannot be considered as a production of an earlier date. In short, whatever may be said to be encoded in the Dendera zodiacs, is encoded with Ptolemaic imagery, and in a Ptolemaic Period monument. Thus, the communicated concept was definitely using the astronomical “language of the times” of the latest temple renovation – an iconography that was thoroughly absent in known Egyptian imagery until that time, but which was present in Greece, Rome, and elsewhere  . The above is relevant when we consider how to interpret H.P. 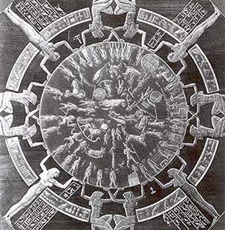 Blavatsky’s mention of the circular Dendera zodiac, which she describes as “the planisphere on the ceiling of one of the oldest Egyptian temples” (SD, II, 368). Obviously, the temple of Hathor as it now stands cannot be considered one of the oldest Egyptian temples, and its iconography is equally absent from older Egyptian representations, while being thoroughly relevant with, if not identical to the astronomical imagery of the Ptolemaic period, and of its Ptolemaic and Roman “signed” rebuilders. 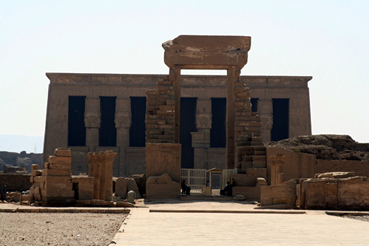 Thus, the Dendera temple can only be considered the latest structure built on the site of one of the oldest Egyptian temples. S.A. Mackey discusses the Dendera zodiacs more extensively in his own works, than what quoted passages found in Theosophical literature may portray. In those publications, Mackey provides a number of additional justifications for his proposed opinions, and also expands further in describing his reasoning on the subject of the Dendera zodiacs. Even though these additional conclusions and justifications are not quoted directly in Theosophical literature, it is of interest to look at some of them in more detail. This is due to the fact that S.A. Mackey’s model of the Earth’s motions, along with his conclusions for the Dendera zodiacs, are subjects often quoted in Theosophical literature (thus making Mackey’s viewpoint important to be aware of). In consequence of this, some more extracts from Mackey's works will be discussed below. These points were discussed in the article above, so they will not be discussed here. They are recounted here to provide a more appreciable context for briefly discussing some other selected points from Mackey’s ideas on the Dendera zodiacs, in the hope of providing a more comprehensive comparative presentation between Mackey’s reasoning and the zodiacs themselves. "It is well known in our time, that the summer half of our year is longer than the winter half by eight days. This is a consequence of the Earth being nearer the Sun in winter than in summer. . . . Thus, Mackey proposes as a corroboration that, on account of what he interprets as “the two Decans in the Ram seated on flames and pointing their fingers to their mouth, expressive of thirst”, it is thought quite obvious that the depiction of the rectangular Dendera zodiac is portraying Aries as an autumnal sign (and that it is also considered indicative of a period in the distant past when the eccentricity of the Earth’s orbit was much greater). Aries being an autumnal sign in this case implicitly corroborates the supposition that the rectangular Dendera zodiac depicts Cancer as a Midwinter sign and Capricorn as a Midsummer sign (which was proposed by Mackey earlier). But let us look at the Decans in question, said to be ‘seated on flames and pointing their fingers to their mouth, expressive of thirst’. Maybe such was a possible interpretation of the early drawings of the zodiac in question. Upon examining the actual zodiac however, we find that what the figures sit on are Egyptian lotuses. Furthermore, the finger-to-mouth posture is a most consistent iconographical element of ancient Egypt, and is a representation of an infant (since infants are apt to take that posture). Fig. 18 Rectangular zodiac of Dendera (detail). From the two Decans, the Decan on the left is the one having a finger in the mouth, representing an infant. The Decan on the right seems to be holding a cup in his hand. 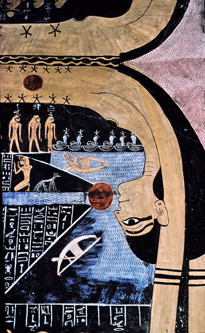 The infant-on-lotus, with the lotus emerging from a body of water, is a very characteristic and common ancient Egyptian symbolic depiction. 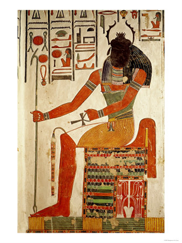 It is often used to portray the deity Horus in its particular aspect of “Horus the infant”  . Fig. 19 Horus as an infant. Here Mackey continues to assume that the beetle / scarab and its relation to the zodiac is an indication of it being a Midwinter sign. He proceeds to interpret a number of figures appearing between Taurus and the beetle as a representation of “a group of three men and women, whose attitudes seem to express, an agreement with a fourth woman on terms of accommodation on board her husband's boat”. 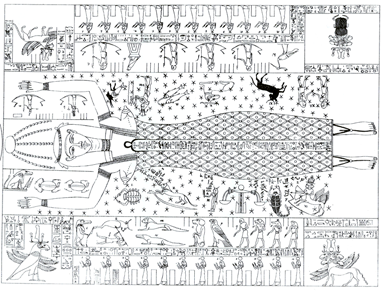 Even though this type of explanation is most dubious and arbitrary in nature, it is conceivable that the 19th century drawings of the rectangular Dendera zodiac might allow such an interpretation. For instance, using the drawing of Bentley (who based his drawing on Denon’s original drawing – being the one used by Mackey), we can locate the group in question, and the individual figures’ orientations and distances might be considered as suggestive for such an approach as Mackey’s. Needless to say, this approach disregards all but an arbitrary “guess” as to what the figures look like, but it is at least possible to be met, under the circumstances. Like previously however, through consulting the actual zodiac, we find that the situation is quite different. Even if we supposed that Mackey’s explanation was potentially plausible, it appears that Bentley has inverted the orientation of each of the figures for some reason. Consequently, the effect produced by the actual orientation as seen on the original zodiac far from allows one to say that it seems to express “an agreement” of any kind, among the group of figures. Fig. 20 Portion of the rectangular Dendera zodiac. Above: Portion of drawing from Bentley (Bentley, 1825, plate VII). Below: Corresponding portion of the actual Dendera zodiac. Incidentally, it can be noted at this point that Mackey here interprets three more "virgins" (female figures with a star situated over their head), figures identical with those he discusses in his "three Virgos" hypothesis (see Fig. 1), as a group of women intending to accommodate themselves on one of the adjacent men’s boat. Quite needless to say, this is a most speculative and arbitrary manner in which to interpret an astronomical drawing. Certainly, more could be said about S.A. Mackey's writings on the Dendera zodiacs. However, the above is hopefully sufficient to give an overview of some significant aspects of this subject, and to also encourage critical and personal study among Theosophical students and researchers. For a complete list of Dendera-related extracts from S.A. Mackey's published works, interested readers are directed to the Appendices section of David Pratt's article "Poleshifts". The Appendices section can be found here. This quote is from part 5b of David Pratt's article "Poleshifts", found here. This is an informative article, involving quite relevant material with what is treated here. (It is noted that the short biographical sketch on S.A. Mackey is also based on "Poleshifts" 5b, by David Pratt). The precessional cycle is commonly supposed to take place without a significant change in the inclination of the planetary axis, with the celestial north pole tracing out a circle, as is shown and described in this short article on the subject. There are two rather famous zodiacal representations pertaining to the Egyptian temple of Dendera that became widely known in the early portion of the 19th century, shortly after Napoleon Bonaparte's military expedition in Egypt. One of these is a planisphere, a map of the stars on a plane projection. It constitutes a circular bas-relief depiction featuring numerous constellations, that was found on the ceiling of the pronaos of a chapel dedicated to Osiris in the temple of the godess Hathor, at Dendera. This zodiac will be referred to as the "circular Dendera zodiac" from here on in this article. The second celestial depiction which will be treated here, commonly referred to as a "Dendera zodiac", constitutes a portion of the ceiling depictions found in the hypostyle hall of the same temple at Dendera. It is a rectangular bas-relief depicting constellations and other celestial elements in a sequential fashion (one positioned next to the other), and will be here on referred to as the "rectangular Dendera zodiac". Drawings of both the circular and rectangular zodiacs are shown below. 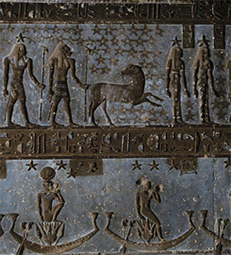 The "Dendera zodiacs". For larger images, interested readers can consult the images collected in this website. 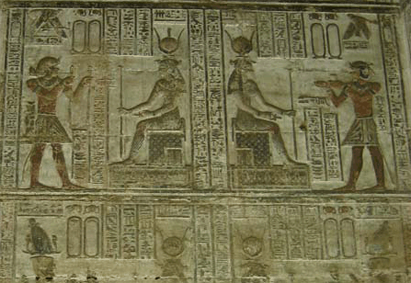 It is noteworthy to briefly mention at this point that there are significantly more astronomical depictions on the walls and ceilings of this temple of Dendera than these two specimens alone. Some of these depictions were chosen by the French artist Vivant Denon to be included in his "Voyage dans la Basse et la Haute Egypte", published shortly after the Napoleonic expedition. This work widely popularized the Dendera temple and also happens to be the source of information on Dendera that S.A. Mackey himself utilized for formulating his theory on these zodiacs (since he had never visited Egypt personally). The image on the left is a detail from the coffin of Heter (early Roman period), and the image on the right is a part of a wall-depiction of these figures from the ancient Egyptian temple of Kom Ombo. These figures are known (through the aid of both Egyptian and Greek inscriptions found in Egypt) to represent the 24 hours of the day and night, which is a very important concept in ancient Egyptian depictions throughout the history of ancient Egypt. The female figures as representations of them appear in a relatively late period, comparatively speaking. In all known depictions, sometimes all 24 figures are drawn with stars overhead, while at other times 12 of them are drawn with stars, occupying half of the zodiacal circle, while the other 12 are drawn with solar orbs overhead, and occupy the other half of the zodiacal circle. 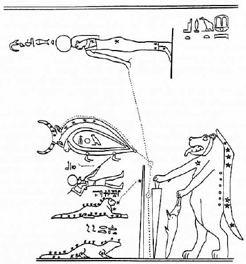 At this point it should be noted that there is another female figure in the circular Dendera zodiac, which is however not shown in Mackey’s drawing. This is a small figure which is directly behind the lion representing the constellation of Leo. This figure seems to be a part of the depiction for Leo, although it is conceivable that it might be considered a third “virgin” in the circular Dendera zodiac. 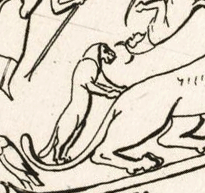 However, closer inspection shows that in the drawing of Denon this figure had been defectively drawn as a type of animal (standing on the lion’s tail), as shown in the image below. It thus appears that the figure in question was not at all conceived as a “virgin” by Mackey, and therefore not even included in his own drawing of the circular zodiac (Fig. 4). Further corroboration of this, is that we can find a similar female figure, partially damaged from the waist down, situated directly behind Leo as depicted in the rectangular Dendera zodiac (visible in Fig. 3, and also in the image provided in Note#3). If we look for this figure in Mackey’s corresponding drawing (shown in Fig. 1), it is found missing. Consequently, this further shows that this figure was not thought to be one of the “virgins” by him. Extracts from EAT, vol1, p. 49, 55, 66-69, 71-76. The exact pronunciation of ancient Egyptian words is not appreciable, as the ancient Egyptian written language did not represent the vowels of words, but only the consonants. By referring to Fig. 5, this scarab found "under Nut's thigh" is roughly discernible in the region slightly above and to the right of Nut's knee joints. "[M]ost prestigious of the statues was that of the ba of Hathor. According to the texts written on the walls, we know that the kiosk [partially destroyed at present] consisted of a gold base surmounted by a gold roof supported by four gold posts, covered on all four sides by linen curtains hung from copper rods. Inside was placed the gold statuette representing a bird with a human head capped with a horned disc. This was Hathor, Lady of Dendara, residing in her house... [This statuette] was carried in the kiosk on the evening of the New Year. " The same face of Hathor, under the rays of the rising Sun, can be seen in Fig. 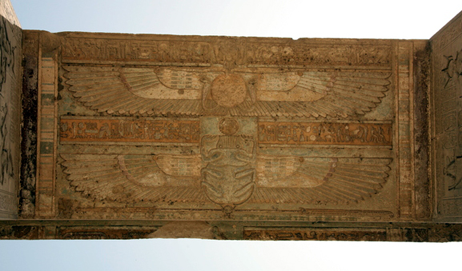 6, as found on the ceiling of Dendera's Chapel of the New Year where this festival occurred. “Heh” means “endlessness”. Hehet being the female form of “Heh”. 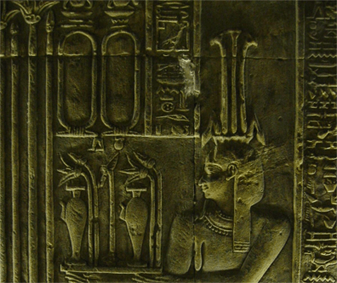 The Nut figures can be seen on the left and right edges, on the sides of the hypostyle hall's ceiling. The gray squares are the positions of columns. The entrance of the temple is in the middle portion of the top of the picture. So, apart from the well-known fact that multiple scarabs at the feet of Nut figures is a very common occurance in Egyptian iconography, in this architectural context an added factor resulting to this "doubling" could very well be that the other Nut figure with her scarab was very physically distant. Thus, in this case, it could be that the scarabs were added to both figures for purposes of contextual completion, also (because the twelfth hour of the Night would be positioned 50 meters apart from the scarab Khepri, were a scarab added only to the first hour of Day). Cartouches are oblong enclosures wherein royal names were inserted. These were commonly reserved for the Pharaoh’s enthronement name. It is said that the rear part of the Dendera temple was apparently built first, probably in the early part of the 1st century BCE. The earliest king named on the monument is Ptolemy XII Auletes (who ruled in the first century BCE), but, like previously mentioned, mostly the temple’s cartouches are empty. Archaeologists consider this to be an effect of dynastic struggles in the mid-1st century. It is understood that the temple was taken down and rebuilt during that period. The massive foundations of the temple probably contain many blocks from the earlier structure it replaced. Early texts refer to a temple at Dendera which was rebuilt during the Old Kingdom, and several New Kingdom rulers, including Tuthmosis III, Amenhotep III and Ramesses II and III are known to have embellished the structure. However, while fragments of earlier periods have been found on the site, there have been no earlier buildings unearthed. Pepi I and Tuthmosis III, being Egyptian rulers who lived 2 millennia and 1.5 millennia earlier from that period, were recalled in the new temple's inscriptions. Below is a relevant collection of extracts from a publication on the subject. The construction of the temple of Hathor [at Dendera] started in 54 BC in the reign of Ptolemy Auletes. [...] The work continued with Cleopatra and her two brothers. From Octavius (30 BC) to Marcus Aurelius (161-80) the cartouches of almost all the Roman emperors of this two-centuries-long period are to be found on the temple's wall. This is in fact one of the last monumental achievements of the Pharaonic civilisation which was preceded, […] as attested by the engraved texts on its walls, by a series of sanctuaries dedicated to the goddess Hathor. In the goddess's chapel, at the back of the sanctuary, is the cartouche of Pepi I who reigned over 2200 years before the first stone of the new Ptolemaico-Roman temple was laid. [...] The Ptolemies introduced Greek culture into Egypt whilst preserving Egyptian culture.[...] The newly built temples generally followed the traditional plans. The walls were decorated with bas-reliefs on which the Greek sovereign appeared as a Pharaoh. His name was transcribed into hieroglyphs, accompanied by Egyptian first names and titles and enclosed within a cartouche.[...] The [subsequent] Roman administration was relatively respectful of the priests, restoring some temples and building others. The temple of Hathor in Dendera was thus completed by the [Roman] emperor Tiberius 185 years after the work was started under the Ptolemies. 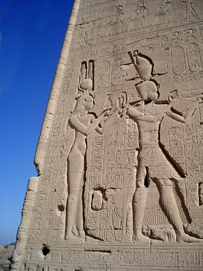 Reliefs of Cleopatra VII (69-30 BCE) and her son Caesarion, on an outer wall of the temple of Hathor, Dendera. What is seen today is only the hypostyle hall of Khnum's temple. A stele engraved with the name of Amenophis II [~15th century BCE] bears witness to the old age of the place of worship which was completely destroyed and whose blocks of stone were re-used in the new religious building which, from the Ptolemaic period, and with the exception of the inner door leading further into the temple, dates entirely from the Roman period. From Nero (54-68 AD) up to Decius (249-251 AD) most of the Roman emperors left their cartouches and most of the inscriptions are from the second and third century AD. Of the Ptolemaic and Roman temple, only the immense hypostyle hall remains in the middle of the town of Esna [...] This imposing hall, supported by twenty four columns and decorated with reliefs from the 1st to the 3rd century AD, does not really have any Ptolemaic features except for the back wall. All the rest is from the Roman period and carefully dated by the cartouches left by the Roman emperors from Nero (56-68 AD) up to Decius (249-251 AD); so that this is truly a Roman building but constructed in the [style of Egyptian architecture]. Part of the Esna zodiac, showing the 12 signs. The hours of day and night are divided in two sets of 12, are represented by the familiar female figures with stars and solar orbs overhead, and are placed at each side of Nut's body (In the left portion of Fig. 16, the hours can be seen along the upper and lower borders of the image). We can also see the circumpolar constellations of Fig. 14, situated in the bottom left portion of the drawing (or, we might say, on Nut's "right side"). This is a usual occurance, since if Nut's head corresponds to the western direction and Nut's feet correspond to the East, her right side would correspond to the North. Noteworthy is the fact that the Babylonian equivalent of Virgo, placed between the Babylonian constellations of “lion” and “scales”, is literally translated as “Seed-furrow” (and that, furthermore, the same "ear of wheat"-holding female figure is very common in representations of the zodiac of 12 signs from various other contexts). Thus, it is probable that the consistent representation of the Virgo holding an ear of wheat in Egyptian iconography was due to more expansive reasons, and not just because of the Egyptian harvest month, as Mackey assumed. Equally important though is to point out the strict absence of these representations (the "virgin with an ear of wheat", the "scales", etc) in earlier ancient Egyptian depictions known to us. So this imagery became "current" in Egypt during the Greco-Roman period, and from then onward was apparently the main medium for expressing astronomical ideas, as all the available zodiacs and astronomical drawings from that period onward show. The other very common mode of representation being Horus depicted as an infant being suckled by his mother Isis.